Latest Jobs in Ghaziabad Varanasi & Lucknow, Sales Officer Jobs, Marketing Manager Walk in Interview, Fena Pvt Jobs 2019 Fena Job Interview Date & Latest News. 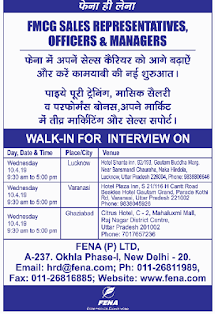 Latest Jobs in Ghaziabad Varanasi & Lucknow: Fena Company has invited all Human Beings to become Fena Sales Representative Jobs WITH ATTRACTIVE Salary. If you are living in Lucknow, Varanasi & Ghaziabad than this Fena jobs For 12th pass will make you satisfy according to their working environment. Fena is one of the Oldest brand of Niram in Uttar Pradesh, India like Wheel, Nirma, Rin, Surf Excel, Tide & Aerial. Walk Interview Jobs in Ghaziabad: There are two other district (Lucknow & Varanasi) Hiring process started with correct address we mention in below time table. Fena Tag Line: Fena Hi Lena. Name of the Posts: FMCG Sales Representatives, Officers & Managers. 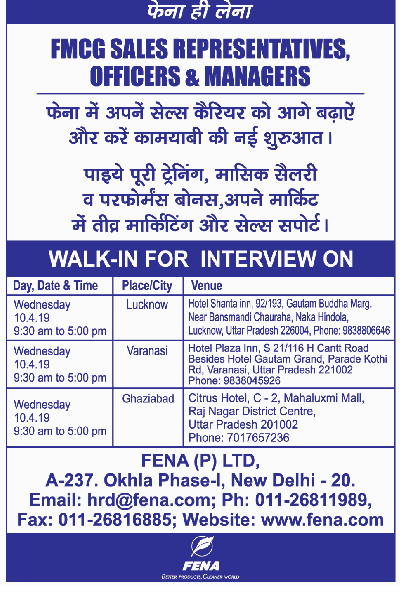 Walk In Interview Date in Fena: Walk-in-Interview on 10th April 2019 (Wednesday). Fena Job Interview Syllabus: You Just make your resume correct with original experience. Work on Good English Speaking and Tight Coputer Typing Skill. Fena Private Limited Jobs: After Selection Process in Fena you will get attractive Salary, Full Training, Performance Bonus. Salary: Good skill, Marketing & Team support will make your job more attractive. Fena Job Interview in Varanasi: Venue:- Hotel Plaza Inn, S-21/116 H Cantt Road, Besides Hotel Gautam Grand, Parade Kothi Road, Varanasi, UP-221002. Fena Job Interview Place in Ghaziabad: Venue:- Citrus Hotel, C-2, Mahaluxmi Mall, Raj Nagar, District Centre, Ghaziabad, UP-201002. Lucknow Job Interview Fena: Venue:- Hotel Shanta Inn, Gautam Buddha Marg, Near Bansmandi Chauraha, Naka Hindola, Lucknow, UP-226004.